King David was at the lowest place in his life. He had sinned by having an affair with a married woman and then this woman became pregnant. He then, in an attempt to hide his sin, had the woman’s husband killed in a battle. But as David found out, you cannot cover up sin because it will find you out. For a while David thought he had gotten away with his sin, but sometime later a prophet named Nathan, who had been sent by God, came and confronted David about what he had done. David ended up paying a great price for his sins; a price David never intended to pay. This Psalm is his prayer to God as he comes clean with everything he had done. The depth of the king’s request is so powerfully heartfelt. He wasn’t asking the Lord to restore his heart; he was asking the Lord to make in him a brand new heart. A heart that was clean; to make something out of nothing! Only God could do that. David knew that his heart was so sinful and so marred, so stained with the guilt and shame of his sin, that he needed for Creator God to start all over within him and create something new. You see, a brand new heart would have no past sins, no spots or blemishes. It would be pure. The word for pure that is used here means; without spot or blemish. It means to be clean. This was David’s cry. He wanted a pure heart, a heart with no defects. The only way he could get this pure heart was to have God create one within him. This is the beginning of purity. It’s recognizing, just as David did, that the heart of man is not pure as it is. It is not, nor will it ever be, without blemish, without sin apart from a work of God. David cried out that he was born with a sinful heart. King David saw himself as God saw him. Only the hands of one who is pure can make a pure heart. God is that One. The moment that David cried out, “Create within me…” he was confessing his need for a new heart because the word he used means to make something out of nothing. David knew a powerful secret when he used the word “create.” He knew that whatever his heart needed he could ask God to create it within him. In David’s case he needed to be made clean and needed to be made pure. In other words, David needed a clean heart created within him because his sin had made it unclean. Do you see the power in this truth? What is it that you need right now? Is it a heart of love for the unlovable? Is it a heart of forgiveness toward someone else? Is it a heart of courage to face an insurmountable circumstance? Is it a heart of compassion or a heart of renewed joy? Is it a heart of peace because of the storm that is raging in your life? Maybe you are like David and you need a heart that is clean. Oh how God is able for He is the Creator God! David’s sin was great, but it was not too great for God! A new beginning can be found. 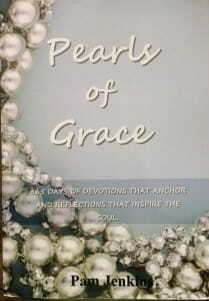 Pearls of Grace is a book of devotions for the entire year, including a read through the Bible in a year calendar, broken down for every day. Beautifully written with encouraging words of hope and empowering words of joy and strength for every woman. Pam draws from the truth and richness of God's Word and gives real life examples in her down to earth style. A must have in your library, click here for more information. For more from Pam Jenkins and Jabbok Ministries, please visit www.jabbokministries.com! Listen to Pam Jenkins's daily broadcast on OnePlace.com. Originally published July 26, 2017.